Samsung's suppliers will be negatively hit to the tune of 20-30% order cut for display, silicon and camera parts in July, revealed yesterday industry insiders in Korea. That's because the overall orders for the flagship Galaxy S4 have been reduced by Samsung to 6.5 million in July, just as we've heard several times before. Suppliers who have good inventory management systems only keep two or three days supply of parts, but those with less than stellar management will be stuck with up to ten days worth of parts that might not get into use soon, which will affect profitability, say the insiders. There was even a rumor that Samsung could announce the Note 3 earlier than the IFA expo in September, to combat the loss of S4 sales, as well as the initial sales of Sony's Xperia ZU aka Togari phablet, which is expected to be announced tomorrow. No doubt the Note 3 will be an excellent phone, but this year it looks like its all about the phablets and Samsung is going to get competition on this segment! Good for the end consumer as more options will be available. True, but I don't think competition overthrowing the Note line just yet, they have a 3-year head start on the phablet front and know what can go right or wrong. They introduced multi-window, new pressure sensitive feedback, airview, a RGB HD AMOLED screen and superb battery life which is still a novelty among phones, and you bet they have plenty of ideas for this year, plus besides the 6" power-friendly AMOLED display, they'll pack a 3600mAh battery minimum. There are many people who are limited by the size of their hands to how big a phone can be before it becomes uncomfortable to hold. Many women and some men have SMALL hands that may even have problems with the Galaxy S3, let alone trying to hold onto the Note 2. For the rest of us, the Note 2 is a better sized device, and going to a 1080x1920 in a somewhat larger device would be even better. You have some people who insist on using a phone one handed, even when the idea of a "phablet" does away with the idea of using it with only one hand anyway. Still, the best device isn't always the most popular, and sometimes the most popular is far from being great. Now, by modern standards, the Note 2 isn't the best phone around, because this is 2013, and there is a new generation of devices that have been launched by different companies. This is why the Note 3 is desired. It's the best thing in the phablet world in case you missed we're talking about phablets. Plus sales don't decide the gadget's quality, it's quality does. I know you love samsung so much, but how you can say that Note 3 is the best phablet?? have you compare it with another phablet?? the reason why i compare phablet with pocketable smartphone because there is so many samsung fans said Note 3 will beat everything on the market. From what i know Note 3 is just S4 with bigger display, stylus and more powerful chipset there is nothing special and unique about it, if i miss something about Note 3 please tell me! I don't get it. What is your beef with samsung? Right now, samsung simply makes the best phablet sized phones period. How do i know? The reviews, market share, popularity, best specs,. Just how many more proofs do you need? Haha did you read my comment properly? Please tell me where i can read review about Note 3?? where i can find some details about Note 3 specs?? I only wish a new design for Note 3 :) And if someone can give competition to Note 3 series it could be Togari from Sony if those renders are true. 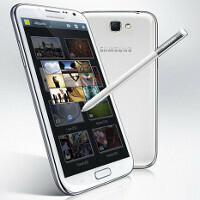 Can't wait to buy Note 3!! Samsung!! Bring it on!! So when did Note 2 start to mass produce, in August or September? Any body who knows? It came out in September, so more than likely in August. If note 2 was an upgrade to the original note, then I ain't worried cos I know note 3 will definitely improve on the note 2 which is simple awesome. I can easily use my note 2 for an extra yr without feeling left behind. This Fon is just something else. i have an S4, but i admit that even the note 2 is just as good and sometimes the note 2 is faster, so im sure it's gonna be hard to dethrone the note 3. Like the Galaxy S4 sales, the Note 3 sales will be good but not that good. I expect the Note 3 to get minimal upgrades from the Note 2 as the S4 did and disappointed techies. Sorry Sammy..
Samsung hasn't lost in any way.. they are winning continuously and that winning momentum may change due to the competition.. Anyway they are winning and that is a fact. If they haven't done so yet, they need to stop producing the s3 because that will help combat s4 losses.